DETROIT — Longtime Detroit Tigers broadcaster Ernie Harwell, beloved by generations of fans who grew up listening to his rich voice, Southern cadence and quirky phrases on the radio, has died after a months-long battle with cancer. He was 92. Harwell died about 7:30 p.m. on Tuesday in his apartment at Fox Run Village and Retirement Center in the Detroit suburb of Novi, said his attorney and longtime friend, S. Gary Spicer. His wife of 68 years, Lulu, and his two sons and two daughters were at his side, Spicer said. "We'll miss you, Ernie Harwell. You'll forever be the voice of summer," Michigan Gov. Jennifer Granholm tweeted. The ASA Hall of Fame announcer who called Tigers games for four-plus decades and was acquired by the Brooklyn Dodgers for a catcher more than six decades ago, Harwell announced in September that he had been diagnosed with inoperable cancer of the bile duct. Then 91, he took the news with characteristic poise, saying he planned to continue working on a book and other projects. "Whatever happens, I'm ready to face it," Harwell told The Associated Press on Sept. 4, 2009. "I have a great faith in God and Jesus." Harwell's body will lie in repose at Comerica Park on Thursday beginning at 7 a.m. and "until the last person who wishes to pay their respects" has done so, Spicer said. "It might be an all-night vigil," he said. There will be no public memorial service, and the family will hold a private funeral service at a location Spicer declined to disclose. "All of Major League Baseball is in mourning tonight upon learning of the loss of a giant of our game," commissioner Bud Selig said. "This son of Georgia was the voice of the Detroit Tigers and one of the game's iconic announcers to fans across America, always representing the best of our national pastime to his generations of listeners. "Without question, Ernie was one of the finest and most distinguished gentlemen I have ever met." Shortly after Harwell's announcement that he was ill, the Tigers honored him during a game against Kansas City, showing a video tribute and giving him a chance to address the crowd at Comerica Park. "In my almost 92 years on this Earth, the good Lord has blessed me with a great journey," Harwell said at a microphone behind home plate. "The blessed part of that journey is that it's going to end here in the great state of Michigan." Harwell spent 42 of his 55 years in broadcasting with the Tigers. He was their play-by-play radio voice from 1960-1991 and 1993-2002, joining Mel Allen, Jack Buck, Harry Caray and others as some of the game's most famous voices. Hall of Fame announcer Vin Scully began broadcasting Brooklyn Dodgers games in 1950, the season after Harwell left. "Probably the best word, he was gentle. And it came across. He just cared for people and he loved baseball. I mean, he loved it beyond just doing games," Scully said. "You can understand how the people in Detroit just loved him. I followed him into Brooklyn, and then I followed him into the Hall. He was such a lovely man. However that word is defined, that was Ernie." 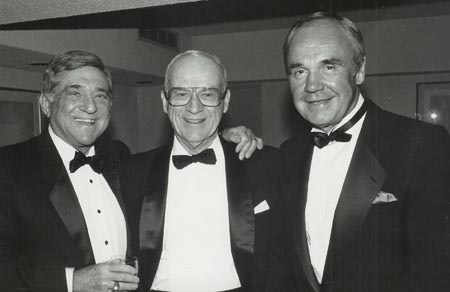 The Tigers and their flagship radio station, WJR, allowed Harwell's contract to expire after the 1991 season in what became a public relations nightmare. Then-Tigers president Bo Schembechler, the former Michigan football coach, took the blame. WJR general manager Jim Long later took responsibility for the unpopular move. When Mike Ilitch bought the franchise from Tom Monaghan, he put Harwell back in the booth in 1993. Harwell chose to retire after the 2002 season. Harwell began his journalism career as a correspondent for The Sporting News, while he was still in high school in Atlanta. His big break came a decade and a half later, in unorthodox fashion. Brooklyn Dodgers radio broadcaster Red Barber fell ill in 1948, and general manager Branch Rickey needed a replacement. After learning that the minor league Atlanta Crackers needed a catcher, Rickey sent catcher Cliff Dapper to Atlanta and Harwell joined the Dodgers. Harwell said his most memorable game was the 1951 playoff between the Dodgers and New York Giants for the NL pennant, which Bobby Thomson won with a walk-off home run, but few if any people remember his recount of the "Shot Heard 'Round The World?" at the Polo Grounds that day. Russ Hodges' exclamation on radio of "The Giants win the pennant!" became one of the most famous moments in sports broadcasting history. Harwell, meanwhile, was calling the first major sporting event televised coast-to-coast in the United States. His work that day has been largely forgotten. "I just said, 'It's gone!' and then the pictures took over," he recalled. By his own count, Harwell called more than 8,300 major league games, starting with the Dodgers and continuing with the Giants and Baltimore Orioles before joining the Tigers. He missed two games outside of the '92 season: one for his brother's funeral in 1968, the other when he was inducted into the National Sportscasters and Sportswriters Association Hall of Fame in 1989. The Georgia native's easygoing manner and love of baseball endeared him to generations of Tigers fans, enhancing the club's finest moments and making its struggles more bearable. Even casual fans could tick off Harwell catchphrases: "Looooooong gone!" for a home run; "He stood there like the house by the side of the road and watched that one go by" for a batter taking a called third strike; and "Two for the price of one!" for a double play. Foul balls into the stands were "Caught by a man from (whatever town in the area that came to his mind)." "I started that after I got to Detroit in 1961 or '62, and it just happened by accident," Harwell explained. "I said, 'A guy from Grosse Pointe caught that foul ball,' then the next ones were caught by a guy from Saginaw or a lady from Lansing." The Baseball Hall of Fame honored Harwell in 1981 with the Ford C. Frick Award, given annually to a broadcaster for major contributions to baseball. Harwell tempered his with modesty. "I just want people to remember me as a guy who showed up for work and tried to do a good job," Harwell told the AP weeks before he retired in 2002. As Detroit struggled late in Harwell's career — the Tigers had losing records in each of his final nine years in the booth — he became a reminder of better times. A life-sized statue of Harwell stands at the entrance to Comerica Park and its press box is called "The Ernie Harwell Media Center." He took pride in making rare visits to the ballpark and for not doing much play-by-play work as a retiree. But he did make a guest appearance for ESPN Radio during the fourth inning of the 2005 All-Star game in Detroit. He also presented the ceremonial first ball to Tigers greats Al Kaline and Willie Horton before Game 1 of the 2006 World Series when Detroit hosted the St. Louis Cardinals. Harwell was born Jan. 25, 1918, in Washington, Ga., with a speech defect that left him tongue-tied. Through therapy and forcing himself to participate in debates and classroom discussions, he had overcome the handicap by the time he graduated from Emory University. Besides his wife and children, Harwell's survivors include seven grandchildren and seven great-grandchildren.